Minerva McGonagall - born in 1935. Early 1930s: The Pure-Blood Directory is published by an anonymous author (presumed to be Cantankerus Nott). 1931: Puddlemere United plays a match against the Ballycastle Bats. Puddlemere Chaser Joscelind Wadcock scores the highest number of goals of any Chaser in the 20th century during this match. 1932: The Ilfracombe Incident occurs. Dirk becomes known as "Dodgy" Dirk due to his remembering the incident, having avoided the Tokes' Memory Charms. 1932: The seventy-sixth Wizarding Schools Potions Championship is held. 1932: The Vratsa Vultures are defeated by the Appleby Arrows in a sixteen-hour match, considered by many Arrow fans to be their finest hour. 1935: The first Atlantic broom crossing by Jocunda Sykes. June, 1936: Celestina Warbeck graduates from Hogwarts School of Witchcraft and Wizardry. 1938: Tom Marvolo Riddle starts at Hogwarts and is sorted into Slytherin house. 1938: The Comet Trading Company release the Comet 180. 1939: Minister for Magic Hector Fawley is ousted from office, and is replaced with Leonard Spencer-Moon. 1939: The Muggle world becomes engaged in the Second World War. 1939: The seventy-seventh Wizarding Schools Potions Championship is held. 10 February, 1932: Edgar Wallace. 1 October, 1930 - Richard Harris, who plays Dumbledore in the first and second film, is born. 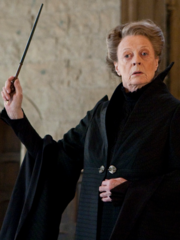 28 December 1934 - Maggie Smith, who plays Minerva McGonagall in the films is born. ↑ Pottermore - New from J.K. Rowling: "Ministers for Magic"
This page was last edited on 10 August 2015, at 12:48. This text is available under the GNU FDL and may have been adapted from the Wikipedia article about 1930s (history).